Taxi hailing app, Uber, has entered into a strategic partnership with Indian multinational telecommunications services company, Bharti Airtel. In a win-win situation for both companies, customers will now enjoy free high-speed internet from Uber, powered by Airtel 4G and riders will be allowed to pay for their trips with Airtel’s mobile wallet, Airtel Money. Starting from Mumbai city, Uber riders can use 4G Wifi ‘UberWiFi’ in cabs. This service will soon be rolled out for all Uber riders pan India. Uber has also announced new plans for its first time users. New Uber riders who top up their Airtel Money wallet will be able to earn up to INR 500. 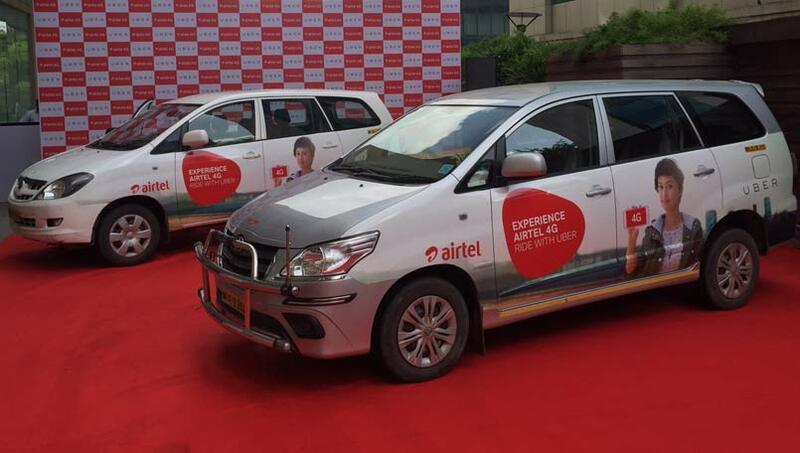 Besides, Airtel plans to become Uber’s official telecom partner across India. It will offer mobile, data and device plans to Uber driver partners. Under the new partnership, Uber drivers will get subsidised mobile devices and data plans. They will be able to use Airtel 4G enabled MiFi dongle, which will have a battery life of 6 hours. In a bid to provide internet access to riders and encash Airtel’s 200 Mn customer base in India, Uber has made a strategic decision to woo customers across the country. However, Uber is not the only one; earlier this week, Ola, launched ‘Ola Select,‘ with benefits like free in-cab Wi-fi and a range of exclusive benefits from partner brands like Myntra, Snapdeal and Cleartrip.